The maximum temperature on Monday was 31.6ºC and the minimum 23.6ºC. The maximum relative humidity was 90 per cent and the minimum 55 per cent. 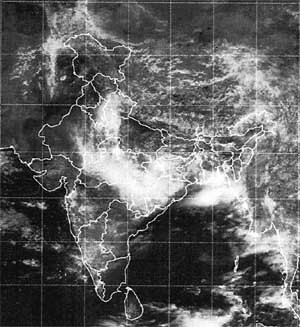 Monsoon has been active in Uttar Pradesh Rainfall: Rain or thundershowers have occurred at most places in Uttaranchal, at many places in east Rajasthan and Uttar Pradesh and at a few places in Haryana, Himachal Pradesh and west Rajasthan. Weather was mainly dry in the rest of the region. The chief amounts of rainfall in cm are: Haryana: Jagadhari 5, Dadupur 3, Tajewala 2 and Hisar 1, Himachal Pradesh: Nahan 9, Berthin 3 and Pandoh and Shimla 1 each, East Rajasthan: Sawai Madhopur 4, Bassi, Deeg, Dungla, Hurda, Jaipur A. P, Mozamabad, Niwai, Roopwas and Sikrai 2 each and Ajmer, Angai, Arwardam, Bari, Bayana, Dholpur, Gulabpura, Makrana, Phagi and Talabshahi 1 each, West Rajasthan: Bikaner and Rajgarh 1 each, East Uttar Pradesh: Rae Bareli 10, Etawah 5, Ankinghat, Fatehgarh and Lucknow A.P. 3 each, Bhatpurwaghat and Neemsar 2 each and Dalmau, Elginbridge, Hanumansetu, Kanpur, Katerniaghat, Mirzapur, Palliakalan and Sultanpur 1 each,west Uttar Pradesh: Dabri 9, Agra and Narora 3 each Bareilly 2 and Mohana 1 and Uttaranchal: Mukteshwar 3 and Dehra Dun, Haripur, Marora and Pantnagar 1 each. Forecast valid until the morning of September 9: Rain or thundershowers will occur at many places in Himachal Pradesh, east Rajasthan, Uttar Pradesh and Uttaranchal and at a few places in the rest of the region. Heavy rainfall warning: Isolted heavy rain is likely in Himachal Pradesh, east Rajasthan, Uttar Pradesh and Uttaranchal during the next 48 hours. Forecast for Delhi and neighbourhood valid until the morning of September 9: Mainly cloudy sky with a few spells of rain or thundershowers. Farmers weather bulletin for Delhi: Forecast valid until the morning of September 9: Light to mdoerate rain will occur at a few places.